The owner boast great visionaries in addition to credibility – training at both the Italian Culinary Institute and advanced masters training at Carpigiani’s Gelato University. He was honored at the National Restaurant Association Show in Chicago for his gelato. The shop itself is elegant and has an in-house laboratory to design his creations. 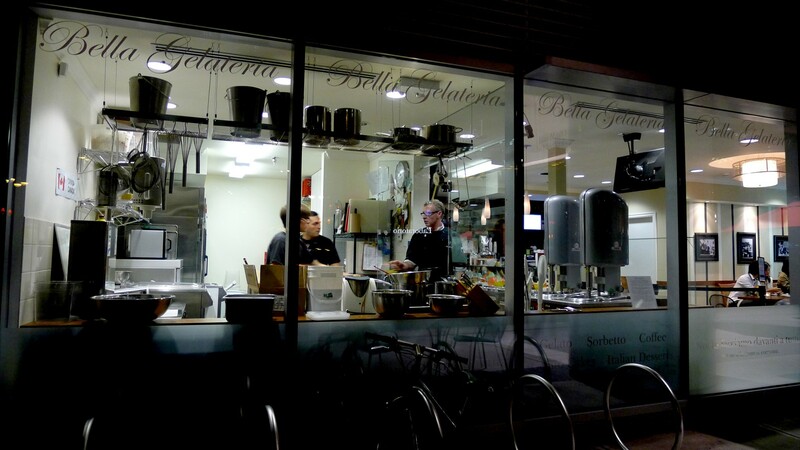 Bella Gelateria believes in the slow food moment and the 100-mile diet where possible, using neither pre-packed frozen ingredients, , industrially prepared pastes or additives / artificial stabilizers. Everything is made fresh from raw ingredients and my favourite Avalon dairy organic whole milk via a 12 hour infusion process to create flavours that are intense and deep. 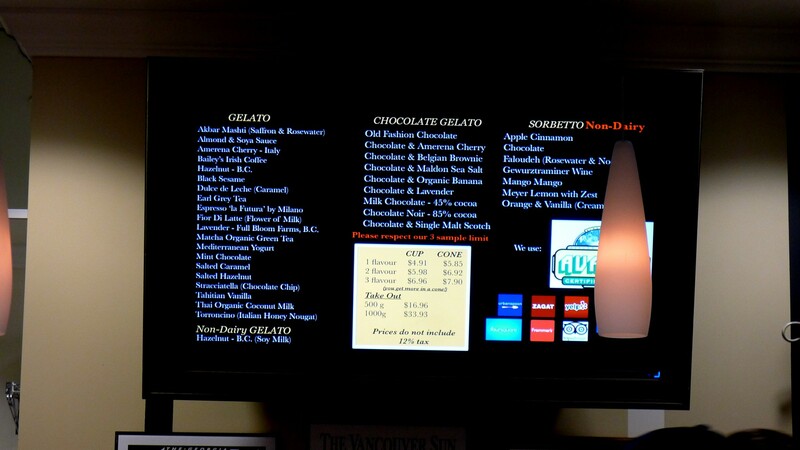 Bella Gelateria Vancouver has over 24 different flavors available: 18 gelato flavours and 6 dairy-free sorbettos. Rosewater and Noodle sorbetto: How mind blowing this was to have little noodle like particles in my ice cream. How light and refreshing that my single scoop dissipated so quickly. Damn it was good. Meyer Lemon with Zest sorbetto: Like fresh lemon zest spraying out from the lemon. It is sweet yet tart but not sour. Lavender Gelato: Strongly fragrant with fresh lavender morsels. I love it. 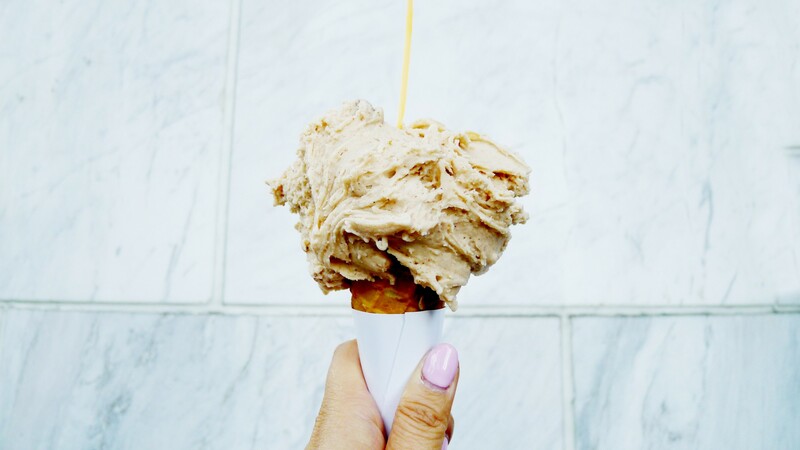 Salted Caramel Gelato: Funny how a little salt brings the flavours out so intensely. But it wasn’t salty to taste it was just incredibly delicious. Milk Chocolate Gelato: Oh the milky coco goodness that is rich and smooth. Pistachio Siciliano (Pistachio): Nutty goodness can be described only as heavenly because it is made from fresh green pistachios and not from flavonoid addictives. Gewurztraminer sorbetto: If you think these aromatic grapes performs best in cooler climates than I guess an ice-cream parlor could be their natural habitat. This sorbet tastes like someone froze my favorite dry white vino in a tube. Bring your girlfriend or partner here and you will score mega brownie points that will leave you grinning ear to ear the next day. Ice cream makes everything better! On a summer’s night, take a stroll down waterfront, check out Vancouver’s Convention Centre and the Vancouver Olympic Cauldron! Where did you take your SO to last time that scored mega brownie points?? ?